From the 15th century onwards such precious metals as gold and silver came into widespread use in the Ottoman palace, and gradually in the major cities of the Empire. It is known, for example, that Sultan Selim I (1512-1520) and his son Süleyman the Magnificent (1520-1566) both learned the art of jewelry-making as princes in Trabzon, and that when they became sultans they had workshops established for the Istanbul jewelers. Both sultans were staunch patrons of jewelers and during their reigns even jewelers outside the Palace produced objects for the Palace in keeping with imperial tastes. Like the other palace artists and craftsmen, the jewelers belonged to trade guilds, known as Ehl-i Hiref. The goldsmiths were known as 'zergeran', workers in gold repousse as 'zernişani' and other jewelers and workers in precious stones as 'hakkakan'. The objects produced by these masters generally have the same features. In the 16th century in particular, the palace jewelers, whose numbers varied from period to period, created their own school, producing work of extremely high quality. The most well-known of these masters was Mehmet Usta. Unfortunately, however, we lack detailed information about the famous metalworkers of the Ottoman period owing to the small number of signed objects. The art of jewelry-making underwent extensive development during the reigns of Selim I and Süleyman the Magnificent, a phenomenon in which the importance of a factor like the existence of silver mines on Ottoman territory in the Balkans, must not be overlooked. 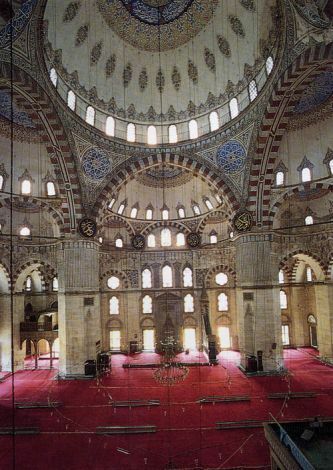 As in many branches of art, Istanbul was the major center for metalwork. Regions such as Damascus, Aleppo and Diyarbakır emerged as important centres in their own right. Damascus work, for example, was known in İstanbul. Damascus masters worked in the capital, and even a distinct Damascus school developed. Important centres of metalwork in Anatolia included Trabzon, Diyarbakır, Erzincan, Kayseri, Erzurum, Sivas, Van and Gümüşhane. The minorities resident in the imperial lands, such as Armenians, Greeks, Iranians, Arabs, Slavs and Jews, occupied a prominent place among the artisans. The Greeks in particular were known for their fine enamel work. Embossed silver was popular among the Byzantines and was later adopted by the Ottomans. Objects made of copper, bronze and iron, which the common folk tended to use, were even widespread among palace circles for everyday purposes, the most important reason for this no doubt being economic considerations. Nevertheless, the tombac wares so widely used during the Ottoman period more than compensated for the absence of gold objects, at least as far as appearances were concerned. This process, which is known to have been in use in Asia already in the earliest Islamic periods, entails the coating of copper and bronze objects with a thin layer of a substance (tombac) consisting of eight parts gold to one part mercury. The plate thereby obtained, which was gold in appearance, lasted for centuries protecting the metal beneath. Since exposure to mercury, a toxin, is harmful to the tombac worker, this technique was later abandoned. Housed today in the Topkapı Palace Museum, the most important examples of Ottoman metalwork offer an unparalleled display of metal objects of all kinds, extremely original in both form and design. Some of these objects, which are found in the Palace Treasury, represent genres that never filtered down to the common folk and are conspicuous for their elegance and superior craftsmanship. An important group of metal objects preserved in Topkapı Palace but as yet little discussed are the objects found in the chamber where the mantle of the Prophet Mohammed is kept. All of these objects, beginning with the gold and silver chests in which the mantle was stored in various periods and including the lock and keys to the Kaaba, the containers of the sacred relics and the swords of the Prophet Mohammed's companions are regarded as masterpieces of jewelry-making. The silver sword scabbards found in the same chamber, together with the other scabbards in the Palace collection, though little discussed in the literature, are important metal objects for the fine decorative work they exhibit. No doubt because of the purposes for which they were intended, most of these objects were made of gold and silver and plated with these precious metals as well. Metal objects enjoyed a wide range of use among the Ottomans, the varieties employed being abundant, colorful and ostentatious. Objects were made of all kinds of metals. Nevertheless, the objects made of gold and silver and decorated with precious stones, such as weapons, helmets and armor as well as table settings and cloths, were produced mostly for show or to be used only for brief periods during special ceremonies. Practicality was therefore not their strong point. Instead, these objects were created for a refined taste and fall into the category of decorative objects that circulated among Palace circles as costly gifts. At the same time, weapons of all kinds from swords and daggers to firearms were fashioned with a delicacy of taste, and their shafts, hilts and sheaths were decorated with precious metals or gems. Among these objects, Turkish swords and helmets merit special attention. Standards, which were used mainly for religious and military purposes, are among the most important examples of Ottoman metalwork. Personal ornaments, which are entirely products of the jeweler's art, are not limited merely to men's and women's jewelry but also include the mirrors and other accessories that were used together with them. The Seljuks' traditional use of bronze did not end with the coming of the Ottomans but continued until the 17th century when it began to decline. Ottoman oil lamps and candlesticks are similar to their Seljuk predecessors though of larger dimensions. Lighting fixtures such as lanterns and candlesticks as well as rose water flasks and censers were used frequently in all periods both in homes and mosques. Turkish bath bowls and ewer basin sets are additional examples of elegance. With their functionalism overshadowed by their superior aesthetic qualities, they lent an ornamental richness to the rooms in which they were used. In addition to metal ewer and basin sets, these objects were also made frequently of porcelain or glass. China and the European countries often manufactured such sets, either of metal or of porcelain in the Ottoman style to be sent to Turkey either as export items or as gifts. Another special group of metal objects were the canteens used for water or sherbet. Made of gold, tombac or bronze and decorated with the motifs of the period, these Ottoman canteens draw attention because of their interesting shapes, for which they are more properly termed "flasks with shoulders". Other metal objects which adorned Turkish kitchens and tables, were silver and copper trays, pots and pans, both with or without lids, jugs, sherbet vessels, bowls, and mortars and pestles. Many objects used in making the traditional coffee, hookahs and pipe smoking were also made of metal, often enamelled or exhibiting niello work. These objects, which included braziers, long-handled Turkish coffee pots, cupholders, water-pipe accessories and ashtrays, were also examples of the art of jewelry-making. Yet another category of objects that merits attention for their display of the arts of metalwork and of jewelry is equestrian equipment. Traditional metalwork continues to thrive today on a larger scale, mostly with the production of copper kitchenware. In many villages and towns, copper pots and pans are still fashioned using the old techniques. The demand for them remains high. The widespread use of copper throughout Anatolia is only natural, considering the abundance of this metal in the region. The floral motifs and arabesques of the Seljuk period and the principalities that followed were also used starting with the earliest period of Ottoman history. Human and animal figures on the other hand disappeared under the Ottomans. A certain amount of Mamluk influence is also discernible in the earliest periods. One prominent characteristic of Ottoman decorative objects is that the same motifs were generally employed in the art of tile-making, textiles, bookbinding and metalwork. The introduction of innovations that later became traditional is also observable. For this reason, despite minor deviations, we can trace the use of traditional Turkish decorative motifs on metal objects almost unchanged over the centuries. Even in their shapes, for example, metal vessels often resemble their porcelain counterparts. The abundance of vegetal, particularly floral motifs is striking among the decorative motifs used in metalwork. The Ottomans developed such a distinct style that their work is easily distinguishable from that of the Arabs and Iranians, and even from that of the Seljuks. Four flowers in particular, the carnation, rose, tulip, and hyacinth, were so often used by the Ottomans that they have almost become synonymous with the period. The relative absence of inscribed objects intended for religious purposes it is also worth noting. With only a few exceptions, objects used in everyday life exhibit the tiny marks which indicate the name of the artisan and the date it was produced. The classic vegetal designs of the earliest periods of the Empire were revised and reinterpreted in later periods. The "hayati" motif, for example, which consisted of arabesque-stylized leaves and branches incorporating as well bamboo leaves of Far Eastern origin, interwoven on the entire surface of the design, together with floral rosettes and entwining branches, was widely used, as was the "rumi" motif, which consisted of stylized animals and delicate, twinning branches. These motifs were sometimes used to cover the entire surface of an object and sometimes merely for borders or the insides of medallions. In subsequent centuries, blossoming branches and, beginning in the 18th century, baroque and rococo motifs came into vogue. Floral bouquets, flower baskets, ribbons and bows were some of the other decorative motifs popular with the Ottomans. Cyprus, pomegranate and floral motifs, still in use today, are observable on copper pots used by the common folk. On silver vessels in particular the artist sometimes gave the surface of the object the appearance of a woven basket. At the same time, objects such as water pipes and cooling vessels were often made of woven silver wire. During the Ottoman period, jewelers in the Balkans produced liturgical objects in keeping with the ancient Byzantine tradition but exhibiting Ottoman-style decorations.